My family loves the Cuyahoga County Public Library. We love preschool storytimes. We love using the Libby app to access the CCPL’s extensive collection of audiobooks. We love that the library provides free lunch to kids during the summer months. We love browsing the toy catalog, and knowing that if you lose one of the balls from the Trix Track, it costs only $3 to replace. But what we love most is having so many branches to choose from. If you’re struggling to fill the calendar this summer, each of the library’s 28 branches makes a great free field trip. (Well, 27 — it’s wonderful that MetroHealth patients can access the entire library’s holdings, but I hope that you don’t find yourself hospitalized long enough to require that branch’s services.) Traveling to more than one library offers so much more than a break from summer boredom. Here are four lessons our library visits have taught us. We signed up for our library cards at the South Euclid-Lyndhurst branch, which I suppose makes it our “home” library. We rarely go to our “home,” though, as prying my son from the well-appointed children’s section so often ends in a tantrum. Traveling to multiple libraries has helped us strike a happy balance between book browsing and playing, while enabling a tear-free exit. For us, that’s the Beachwood branch, where we stop for our reserve books en route to the toys. Touring the CCPL’s branches also has helped us find reading nooks to match our moods. In winter, the window seat in the kids’ section of the Chagrin Falls branch has a gorgeous view, perfect for piling on to read picture books. The comfy chairs around the fireplace at the Orange branch when we want to read near each other but not with each other. The kids’ courtyard at Beachwood is a secret garden that’s perfect when our little reader is a little loud. Takeaway: Try on different libraries to find the best space for your family. Last week, I walked upstairs to find my son had built a library. 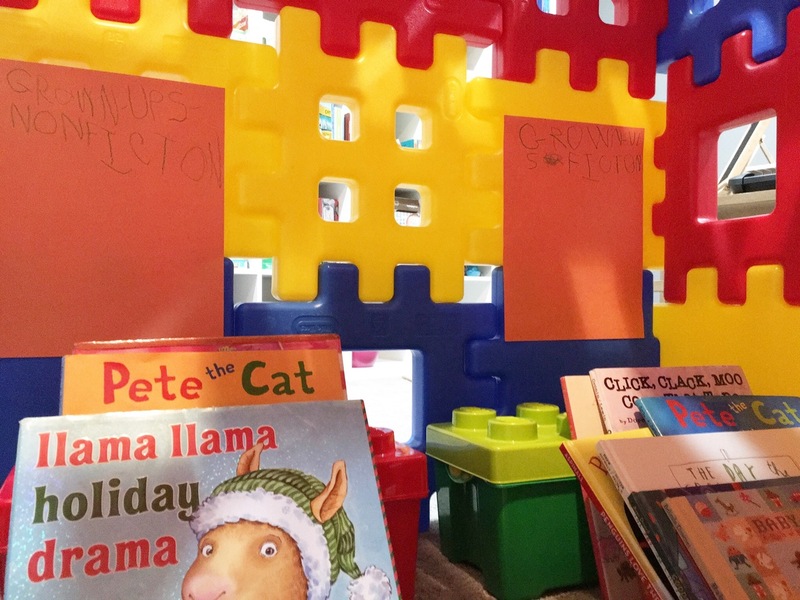 He’d taped handwritten signs to waffle-brick walls to separate “GROWN-UPS NONFICTION” and “GROWN-UPS FICTION.” Unless Pete the Cat and Llama Llama are biographies, he needs a little practice. He is, however, understanding that books can be categorized. That sense for categorization started when my son realized that every library we’d visited had signs for children’s nonfiction. He’s learned that while fiction is shelved by author, the nonfiction is grouped into categories. He’s also learned that no matter where he goes, outer space will be in the 523s. Takeaway: If you have the kind of kid who makes neat lines of cars and Hatchimals in every doorway of your home, you can win him over with library classification systems. As you travel to multiple branches of the CCPL, you’ll start to notice some familiar features. The Beachwood branch’s children’s section is an open room bordered by low book shelves, with a narrow spur filled with toys. On my first visit, I planted myself on the floor next to the puppet theater and had a lovely time playing with the kids who wandered in. What I didn’t realize until I’d visited more than one of these spaces was that it was my job to stay out of them. The South Euclid-Lyndhurst branch’s children’s space is cavernous, but at its center there’s a Journey-inspired tent with lookout holes for tiny patrons. The Orange branch uses lowered arches to separate the children’s section from the rest of the open floor plan. There are always tables and chairs nearby, but never directly inside, these spaces. I’ve implemented a self-imposed ban on entering the kids’ spaces, to great effect. A few weeks ago, I heard my son say, “Pleasure to meet you. What’s your name?” before spending a happy half hour playing with a new friend. Takeaway: Kids have precious few social spaces not overrun with grown-ups. The library’s children’s section should be one of them. I was ready to take the CCPL’s architectural hint and give my son some space to explore on his own, but what I really, desperately wanted was some space to explore on my own — to, for the first time since he was born, have a little independent browsing time. Traveling to multiple libraries has taught me that some are particularly well-suited to giving both kids and adults some independence. Both the Orange and Beachwood branches have grown-up stacks within view of the children’s section, which gave me time to build my summer reading stack. Takeaway: Try different libraries until you find one that best allows every member of the family to browse to their comfort level. Our tour of the library has taught us two final lessons. First, borrowers are allowed only 50 books at a time, a number easily exceeded if you’re filling bags with picture books. Second, in a world of credit cards and invisible purchases, making your child turn over a few dimes for the book he forgot under his bed is a valuable financial lesson. Next month we’re expanding our field trips to the Richmond Heights, Mayfield, and Gates Mills libraries. Want to join us?